Cake pops are a delicious and fun treat. With tiny bite-sized pieces of cake coated in delectable soft candy coating, cake pops make a delicious dessert or festive party favors. The best part is they are very easy to make whether you choose to hand roll them with frosting or bake the cake in a pop mold. Making hand rolled cake pops doesn't require much special equipment. Bake the cake according to the package instructions or your cake recipe. Allow the cake to cool completely. Using your hands, crumble the cake into a large bowl until it is in fine crumbs. 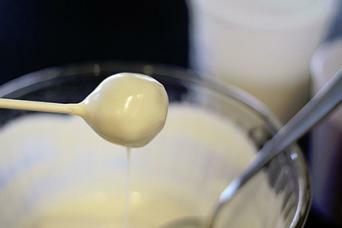 Add prepared frosting about one tablespoon at a time, mixing with your hands as you add. The goal is to make the cake moist enough to roll into a ball while still having a slight bit of crumbliness to it. How much frosting you add will depend on how moist the cake is, but it's usually about 2 tablespoons to 1/2 cup. Using the mini ice cream scoop, scoop balls and roll them with your hands to even out the shape. Set them aside on a piece of parchment until you have rolled all the cake pops. In a medium-sized bowl, melt about half of your candy melts according to the package instructions. Dip one end of the ball into the melted candy and insert the cake pop into that end so it goes in half to 3/4 of the way through the pop. Once you have all the sticks inserted, put the cake pops on a platter to freeze them so the sticks stay in place. Leave them in the freezer for 30 minutes. Remove the cake pops from the freezer. Melt the remaining candy melts in a bowl. In small, shallow bowls or on a small plate, put any of your decorations such as candy sprinkles. Lay out a fresh piece of parchment on a tray. Holding each cake pop by the stick, dip it fully in the melted candy. Swirl the candy all around to coat the entire cake pop, allowing any excess candy to drip away from the pop. Roll the cake pops in the sprinkles or other decorations. Put the completed cake pops in the styrofoam block or cake pop stand with the sticks pointed down. If you wish, wrap the cake pops in cellophane and tie them with a ribbon once the candy coating has hardened. Many manufacturers sell cake pop molds, which makes the process much easier. These pops do not have frosting mixed with the cake. Preheat the oven to 350 degrees Fahrenheit. 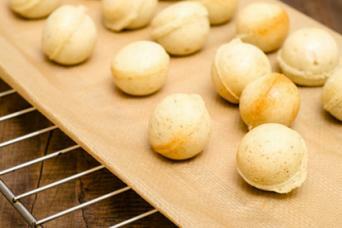 Use shortening or butter and flour to flour and butter the both sides of the cake pop molds. Prepare the cake batter according to the package instructions or your recipe. Fill the cups in the bottom mold entirely to the top with batter. Put on the top mold and bake the cake pops until a toothpick inserted in the hole in a mold comes out clean, about 15 minutes. Remove the cake pops in the molds from the oven and place them on wire racks to cool. Cool the cake pops completely before proceeding. When the cake pops have cooled, remove the top mold. Remove cooled cake pops from the pan carefully, putting them on a platter. Using a sharp paring knife, trim any ridges from around the edges of the cake pops. Melt about a quarter of the candy melts according to package instructions. Using the cake pop stick, poke a hole in the center of a cake pop. Dip the stick in the melted candy so it is coated, and then drip a little of the candy from the stick into the hole in the cake pop. Dip the stick again if necessary, and insert it in the hole in the cake pop. Allow the candy to harden completely before continuing. Melt the remaining candy melts, and lay out any decorations such as sprinkles in a shallow bowl or on a plate. Lifting each cake pop by the stick, dip it in the candy melt, and swirl it to distribute the candy, allowing any excess to drip away. 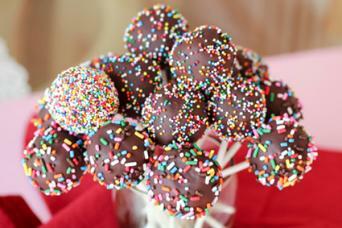 Roll each cake pop in sprinkles after you dip it. Place the cake pops with the stick side down in a styrofoam block or cake pop holder. Allow the candy to harden completely. Cover the pops with cellophane and tie it with a ribbon, if you wish. Consider the following tips when making cake pops. Use the type of cake you would typically frost, such as a chocolate birthday cake or a carrot cake. Avoid extra light or extra heavy cakes like pound cake, flourless cake, or angel food cake. If you make your own frosting, use a simple buttercream made from butter or cream cheese, powdered sugar, and a little bit of liquid. Avoid meringue and cooked frostings. The great thing about cake pops is they allow you to be creative. Once you've mastered the basic pop, experiment with flavors and more detailed decorations. These adorable miniature cakes make the perfect treat for any occasion.